The ozone record went on after the Belgo-Dutch expedition left Base Roi Baudouin at several stations and most notably Syowa and Halley Bay. Since the early seventies, satellite instruments based on the observation of reflected and back-scattered solar UV began to complement the Dobson network and produce thematic ozone maps. It was in Syowa that in 1979 a decrease in the October values was first observed, the relation between this decrease and chemistry became apparent when the British Antarctic survey published similar results in NATURE in 1985, these publications led in turn to a reanalysis of satellite data where previously low ozone values had been discarded. 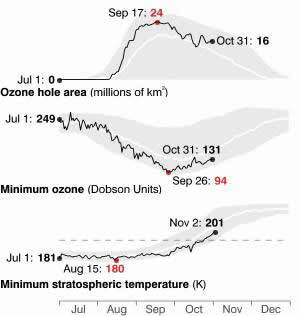 In 1987, the ozone hole clearly appeared on the satellite map and since, it has come back every year. Since 1995, European satellite instruments with Belgian participation have become one of the main sources of ozone data as GOME, SCIAMACHY and the operational GOME-2 on METOP. The main NASA ozone instrument OMI is now a Dutch design based on these previous European designs. Videos of the Ozone Holes can be download from differents sites. An example is given by the Nasa Goddard Space flight Center.